Melanie's second week of the #trysomethingactive challenge! Win a Nestlé gluten-free hamper! 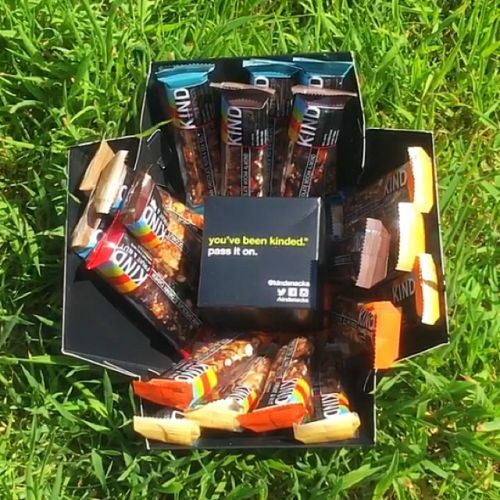 You all know I love finding new delicious healthy snacks, so when KIND got in touch and asked if I fancied trying some of their bars I couldn’t wait for them to arrive…and I managed to secure a little giveaway competition for you guys too. Having already fallen in love with the dark chocolate nuts & sea salt bar after finding KIND at an expo last year, I was eager to try some more and I’ve decided to give you a short review of each bar so you know what to expect. But first of all, what’s the deal with KIND bars? They’re all gluten-free (yay) and a lot of them are dairy-free too! Each bar is high in fibre, made from whole nuts, fruits and spices and bound together with honey for a simple and delicious snack. 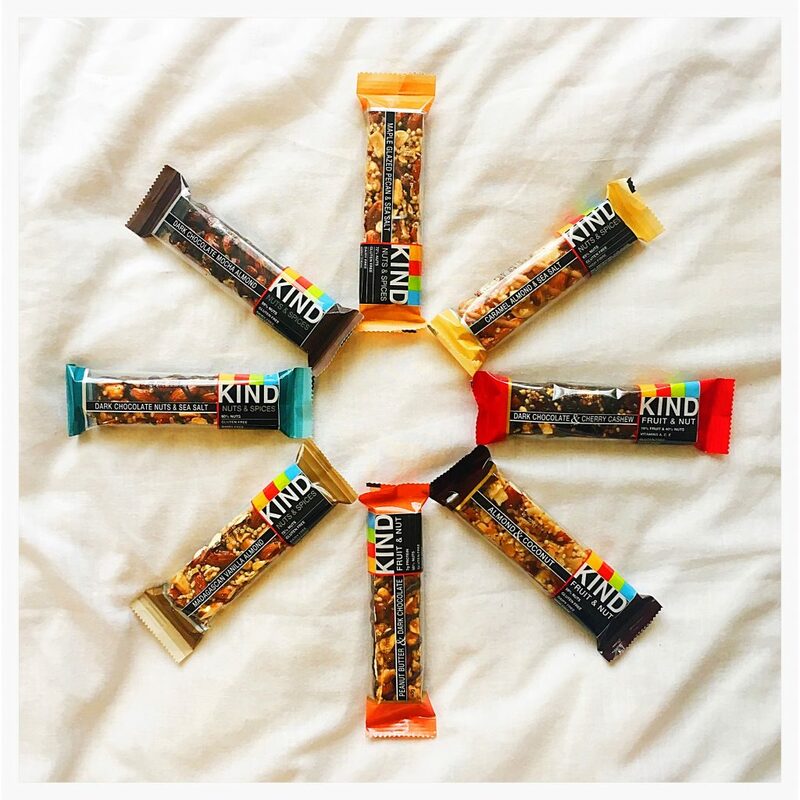 And they are seriously nutty – on KIND’s website it says their bars are crafted with up to 72% nuts! The perfect way to get some good fats in your diet. Oooh, and they contain no artificial colours, flavours or preservatives. The way KIND see it is they’re only using ingredients you can see and pronounce – which I love! The bar reviews are in no particular order (but I will tell you which ones are my faves). This was the bar that kick-started my love of KIND bars back when I very first tried it at an expo. It’s like a healthy Snickers but without the toffee bit and it’s really hard to believe this is healthy! The chocolate and nuts combo is divine – it’s both chewy and crunchy, which I think is bloody delicious! This bar is slightly softer than some of the others (because pecans are obviously quite a soft nut). It’s not one of the most exciting flavours as far as I’m concerned but that certainly doesn’t mean it’s not tasty! It has a great crunchy chewy texture thanks to the addition of maple syrup with the nuts. First of all, I feel I should point out that I don’t actually like coffee (at all) or almonds (very much). Yet somehow I really like this bar! It’s strangely now one of my favourites! When you bite into it you get a lovely crunch followed by a chewy toffee style texture. 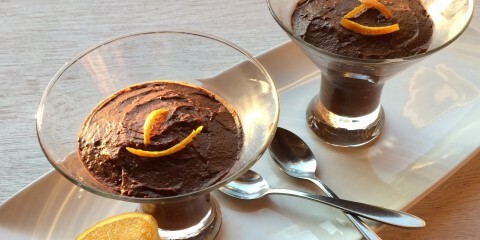 The coffee flavour is just right – not crazy strong but not completely masked and I particularly love the ‘gooeyness’. Well done KIND – I have no idea how you did it but you actually made me like something that contains two items I’m not a fan of! The smell of coconut that I got from the second I opened this bar’s packaging instantly made me fall a little bit in love. The texture is much softer than the other bars in the range making it deliciously chewy with a very slight crunch. It’s super sweet because of the coconut, which is perfect for me with my sweet tooth…and the almond flavour isn’t overpowering as the coconut masks it (which is great for me as almonds aren’t my favourite). Although this has almonds in the name, I could taste the peanuts more, which works perfectly for me as I’m a sucker for peanuts (and peanut butter). The vanilla taste complements everything else in this bar perfectly and although it’s somewhat more plain than some of the other bars in the range, it’s still lovely. The texture is fab – so chewy with a great crunch! This is one of my absolute faves! The caramel and sea salt drizzle on top of the nuts mixture is incredible – it basically tastes like a kind of dessert bar. To give you an idea of how good this bar is…let me remind you that I don’t actually like almonds! Yet I’ve bought more of this bar since trying it! The caramel coating is so creamy and delicious and works perfectly with the super crunchy nuts. 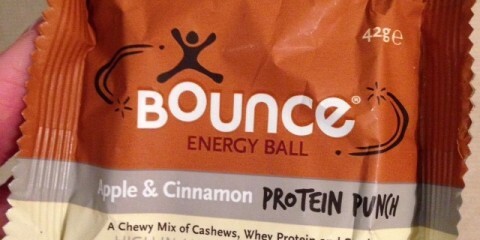 This bar is super soft and chewy – it has a much softer texture than most of the others. The dark chocolate and cherries work very well together, but I’m not a huge fan of this one as it’s a bit too fruity for me and I tend to like more nutty snack bars. My mum loves it though. I’ve saved the best for last. I’ve got quite a few favourites in the KIND range, but this one is so good that I would happily eat it instead of a Snickers. Seriously! It smells exactly like a Snickers and has a perfectly balanced texture of crunchy and chewy. The addition of dark chocolate is what (in my opinion) makes this bar better than the dark chocolate nuts & sea salt bar that used to be my fave. 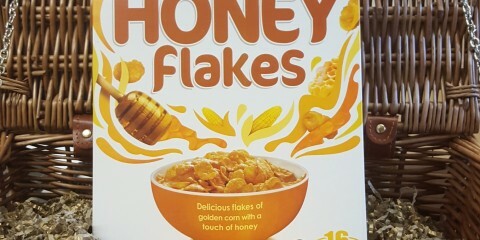 I seriously struggle to believe it’s healthy! 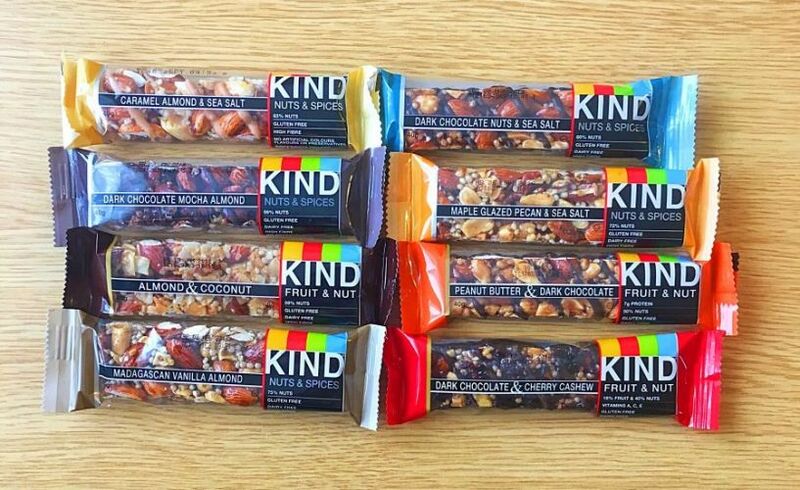 Depending on where you buy them, KIND bars cost £1.25-£1.99. In my opinion, yes! Each snack bar tastes great, fills you up and gives you some fibre and good fats – which I think makes them well worth the money. Oooh, and right now I have a giveaway over on my Instagram page so you could be in with a chance of winning your own little box of these delicious snack bars! Head over to @happyhealthynat on Instagram now to find out more. 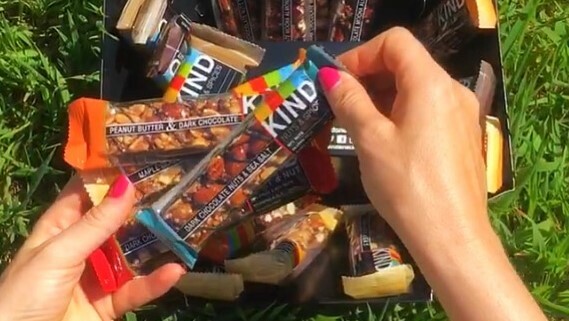 Just scroll down to find the video of me opening the KIND bars box on my Instagram page. Then follow me on Instagram, like the post and comment on it tagging a friend who you (might) share some of the bars with if you win. The competition closes on Monday 24 July at 9am, and the winner will be announced on Friday 28 July. Entrants are deemed to have accepted the following Terms & Conditions and agree to be bound by them when entering the competition by Happy Healthy Nat to win one small box of KIND bars. Users are eligible to enter this competition on Instagram. One winner will be selected. To enter on Instagram, entrants must follow Happy Healthy Nat on Instagram, like the competition Instagram post and tag a friend in the comments. Entrants must be at least 16 years of age. Entrants must live in the UK (due to postage cost restrictions). The competition may be modified or withdrawn at any time. The winners will be notified by Happy Healthy Nat through Instagram, so entrants acknowledge when entering this competition that their names (and usernames) will be published on the retrospective social media channel to alert them of their competition win. Entrants can enter on their Instagram account. The competition opens at 07:00 on Monday 17 July 2017 and closes at 09:00 on Monday 24 July 2017. Winners will be announced on Instagram on Friday 28 July 2017. Winners must respond to Happy Healthy Nat within 14 days of being notified of their win, otherwise Happy Healthy Nat reserves the right to select an alternative winner. This competition and these Terms and Conditions are subject to and governed by English law. The competition prize is non-transferable and cannot be exchanged or refunded. False and or deceptive entries or accounts shall render entry ineligible. The promoter of this competition/prize draw is Happy Healthy Nat in collaboration with KIND.